Most experts were perplexed when Saudi Arabia suddenly targeted Qatar out of the blue last month with a number of ultimatums primarily tied to their alleged funding of Shiite backed terror groups. And perhaps as no coincidence, their ire against a fellow OPEC member came shortly after President Trump paid a visit to the Middle Eastern kingdom. But what only some are coming to realize in this standoff is that the threats by the Saudi's against Qatar likely have little to do with terrorism, or with their joint agreements with Iran over natural gas fields, and instead are tied primarily to the fact that Qatar is quickly becoming a threat to the long-standing petrodollar system. The Emirate of Qatar has become an important pillar of China's efforts to make the Chinese national currency Yuan an internationally accepted currency of commerce. It is possible that this fact also plays a role in Saudi Arabia's pre-emptive isolation of the emirate, the Antimedia reports . Saudi Arabia had increased the pressure on Qatar following the visit of US President Donald Trump. Trade between Qatar and China in Yuan has experienced a significant upswing in recent years. In the past two years, the Industrial and Commercial Bank of China (ICBC), which has been established as a Chinese bank in Doha, has already traded around RMB 590 billion (about $ 86 billion) in the past two years . Ironically, the ultimatums being placed on Qatar by Saudi Arabia are eerily similar to the ultimatums given to Serbia by the Austro-Hungarian empire approximately 100 years ago when they wanted to start a war so badly that the demands were virtually impossible for the Serbians to meet. Yet the real question needing to be asked is... are these ultimatums actually coming from the House of Saud, or are they being pushed into them by the U.S. who desperately needs the petrodollar system to continue just to survive? 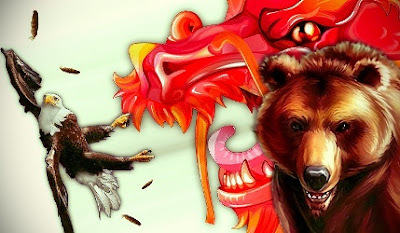 The U.S. is doing everything in their power to provoke a war with Russia, China, and with any country in the Middle East that threatens their control over the global reserve currency. And since the world is quickly rejecting the dollar, and nations now have multiple alternatives to using the reserve currency, all that Washington has left is the war card to try to ensure that the dollar remains the singular reserve currency, and that neither upstart powers in Asia and Eurasia supplant their empire early here in the 21st century.